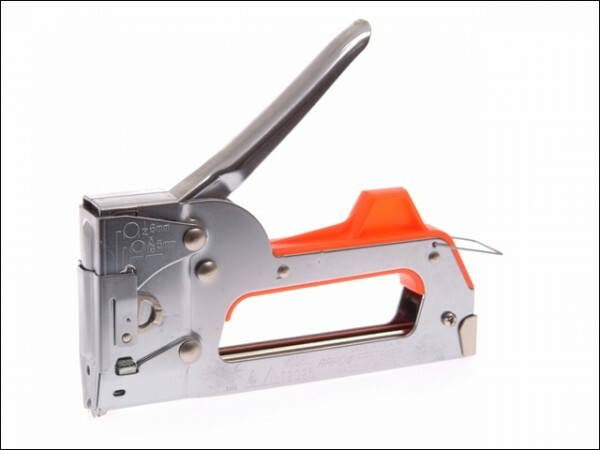 This Arrow T2025 Staple Gun has a built-in staple height guide. This revolutionary guide is easy to use and enables the powerful staple gun to shoot flat crown staples and round crown staples. The guide can be adjusted so that round crown staples will fit wire and cable from 1/8in (3mm) to 1/4in (6mm) diameter. The T2025 fires 4 sizes of round crown T25 staples. 9/32in (7mm), 3/8in (10mm), 7/16in (11mm), 9/16in (14mm). and 3 sizes of flat crown staples.